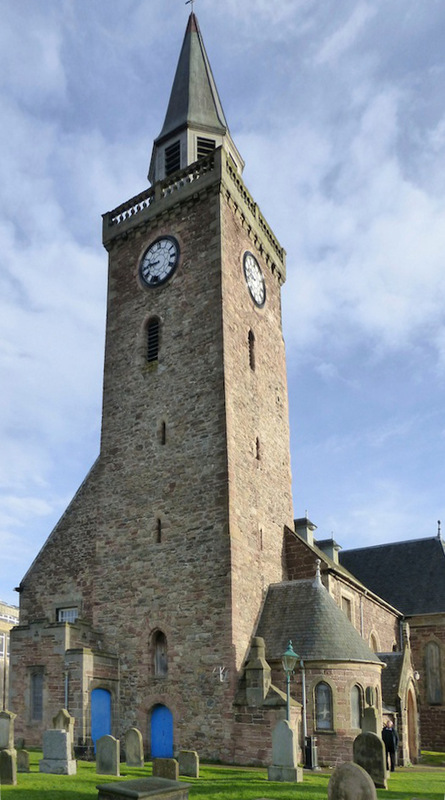 Left: The west tower of the church, facing the River Ness. Right: The south elevation, showing the small apsed vestry projecting from the tower, the south-east porch, and then the large semi-octagonal apsed addition on this side, at the central bay. Old High Church, Inverness. 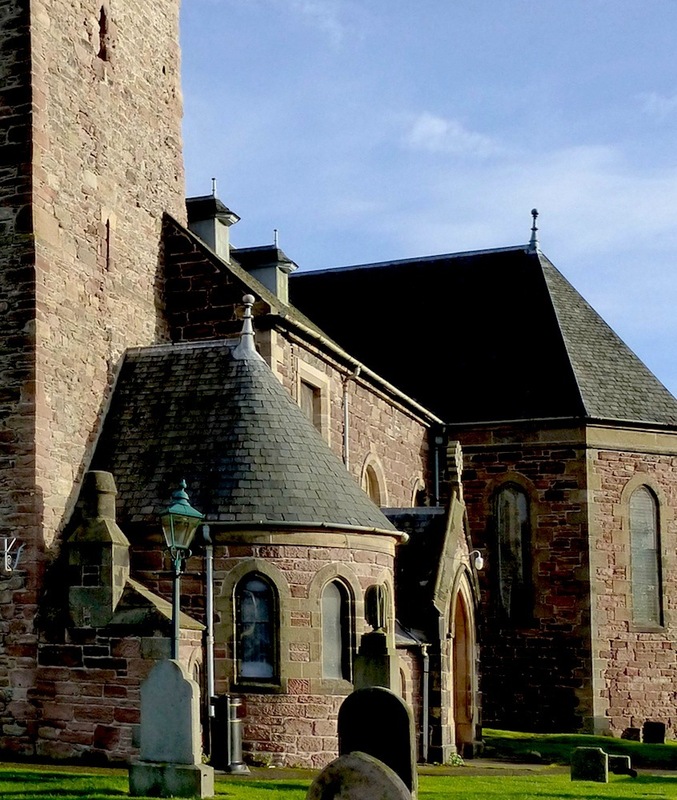 According to its listing text, this Category A listed church is the oldest one in Inverness, its west tower dating back to the late sixteenth century. But, like so many other churches, it was altered in Victorian times. Alexander Ross (1834-1925) and Robert John Macbeth (1857-1912) made some additions to the south side in 1891: two porches at either end, and, more significantly, an apse in the middle, with a chancel arch at the opening. Typically, the capitals were "carved with vigorous foliage" (Gifford 187). At this time too the church was reseated (MacLauchlan 4), so its internal appearance must have been quite considerably altered. Another local architect, William Laidlaw Carruthers (1859-1914), was also involved here at the end of the decade, for example, adding an apsed vestry in 1899. Carruthers had been apprenticed to Ross from 1876-81. Left: The east end, showing the south-west porch. 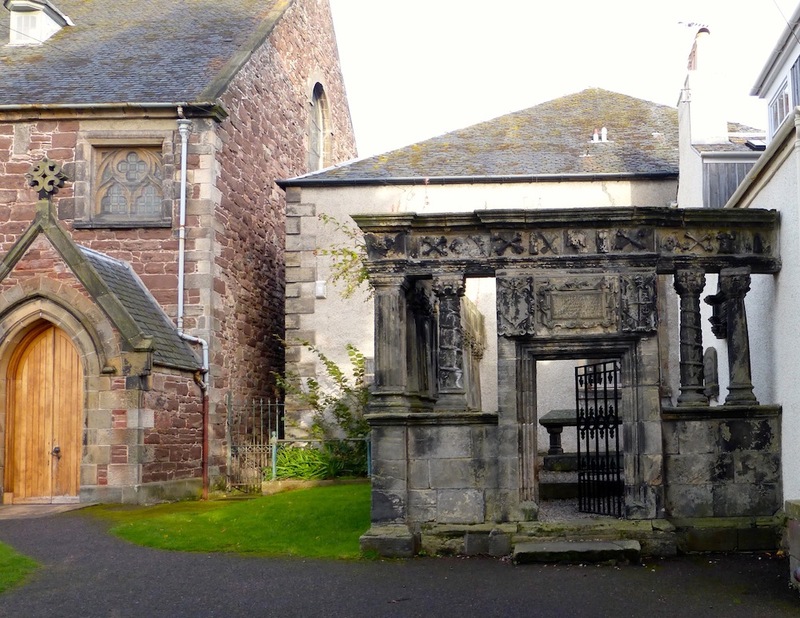 The burial enclosure next to it is for the Robertson family, and dates back to the 1660s. Right: One of the nineteenth-century headstones in the churchyard. The headstone is to Lachlan MacBean, a flax dresser, and his wife Isabella and sons Angus and Donald. Lachlan and his wife died in their 60s, Angus predeceased his mother, but the other Donald, was at one time a Tacksman, who leased and sublet land from the landowner. 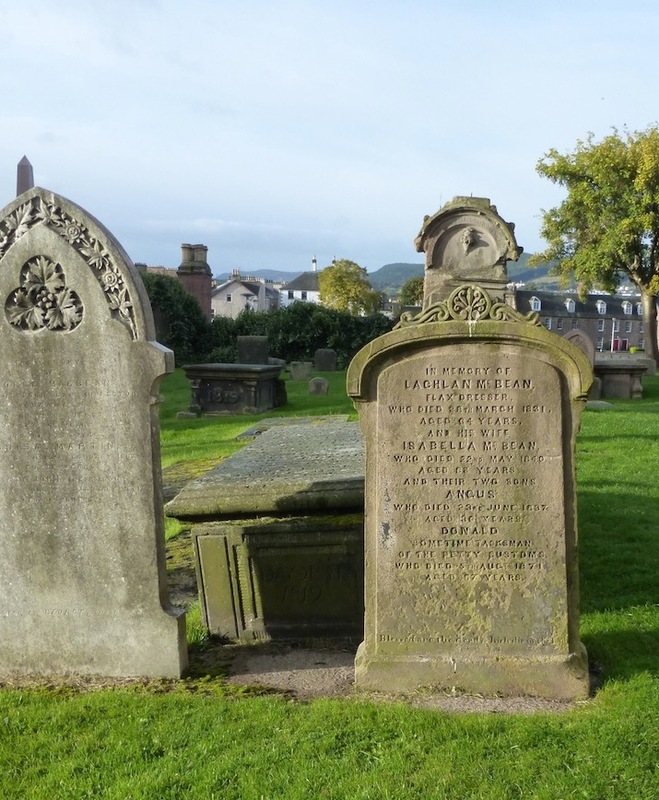 You could learn a great deal about the social history of the Highlands in this period by researching the people buried here, and their occupations. "Inverness, Church Street, Old High Kirk." British Listed Buildings. Web. 28 December 2017. MacLauchlan, F. J. L. "The Old High Church." Accessed from Old High St Stephen's Church (Church website). "William Laidlaw Carruthers." DSA (Dictionary of Scottish Architects). Web. 28 December 2017.